This is how every sales leader wants to describe their sales organization. 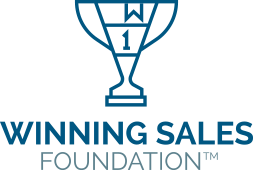 Winning Sales Foundation™ lays the framework for a strong sales organization that can be desribed in this way, allowing sales management to reach their financial and strategic sales goals. This comprehensive solution is designed for scaling an existing sales team, building a new team, or launching a new product or initiative. It begins with deep discovery and a customized project roadmap of priorities and goals. Based on this, sales enablement tools and processes are developed, with ongoing one-on-one executive leadership coaching and expert operational support running concurrently. The final step is sales training and implementation, to ensure buy-in throughout the sales organization for lasting success. Not sure if Winning Sales Foundation is right for you? Evaluate the health of your sales organization with our free Sales Organization Assessment. Five components are at the core of the Winning Sales Foundation: strategy, tactics, process, tools and execution. Click on the solution icons to the right to learn about each of the solutions included in Winning Sales Foundation. Do I Need Winning Sales Foundation? Is your sales organization struggling? Are you unable to make your sales goals? Do you have a new product or initiative ready to launch, but no internal framework to support it? Are you aware of issues within your sales organization but unsure what they are or how to fix them? Are your sales reps unmotivated or adverse to change? Conversely, does your team have high potential but lack the resources needed to succeed? If any of these questions sound familiar, Winning Sales Foundation can help getting you fast-tracked for sales success.